In the past year there has been a lot of buzz and news about the Cronut. Most of it exciting, and all of it thanks to the pastry genius of Dominique Ansel. But today we have new Cronut-related information to share with you, and it comes from the daring and crafty hands of food blogger Amy, the brains behind Oh, Bite It! 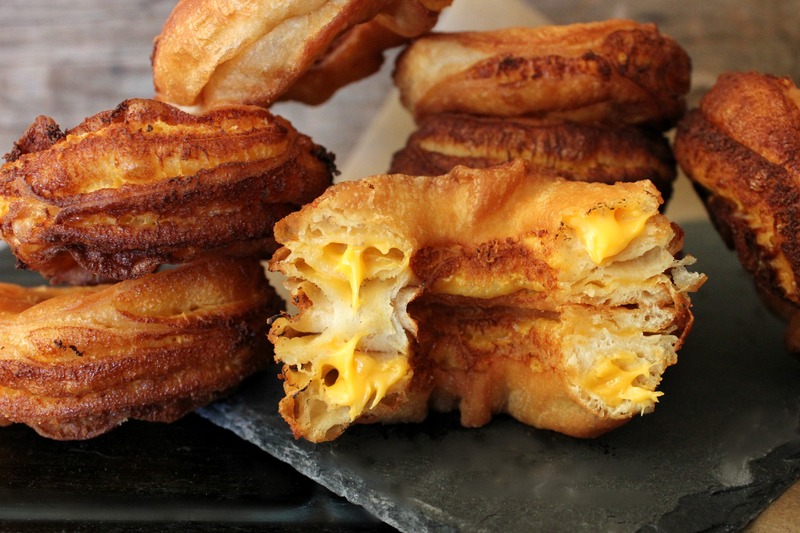 Amy has taken America’s two most glorious foods — the grilled cheese and the Cronut — and merged them into ONE. The good (and bad) news is that they’re super easy to make. Anyone familiar with Oh, Bite It! knows that this cooking genius is not one to labor over difficult recipes. The ingredient list is lowbrow — it calls for Pillsbury Crescent Dough Sheets, Velveeta cheese slices and oil for frying. The whole thing comes together in a few short minutes — unlike Ansel’s Cronut recipe which takes three days. And the result is something you will never forget — especially if you serve them with tomato soup, which of course you should.